Welcome to this week's edition of Frugal Friday! Lots of goodness in Frugal Friday land last week. Let's get right down to the fun stuff, shall we? Last week's Fan Favorite was one that I had chosen to feature this week anyway, and then realized it was the overwhelming Fan Favorite from last week. 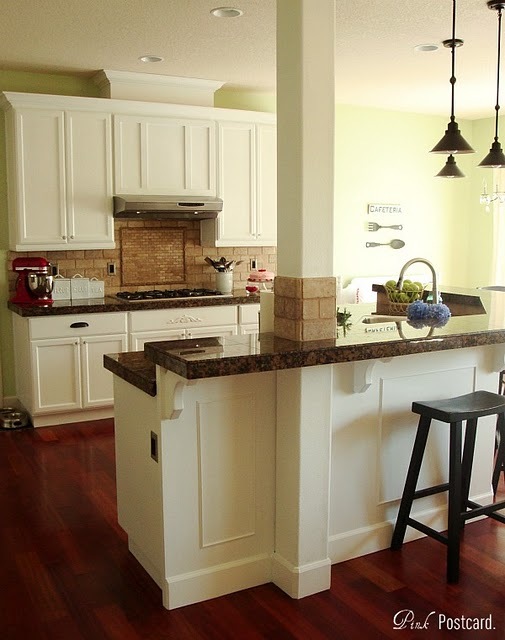 This fabulous kitchen tranformation from Pink Postcard was achieved with a little white paint and a lot of elbow grease. Love. it. too. much! 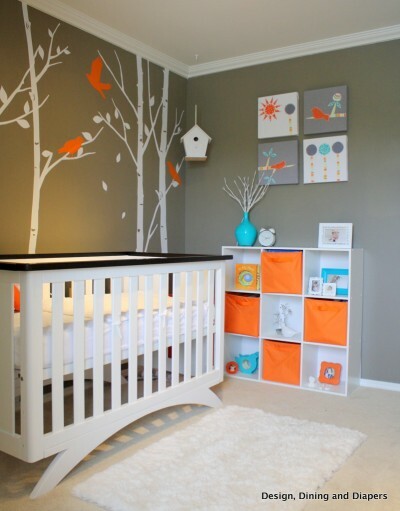 Design, Dining + Diapers shared her beautiful modern nursery makeover. I just love the color combo in this room. Perfection. Domestic Imperfection shared her amazing $10 dumpster rocker makeover. Love the fresh and pretty result. December Skye shared her ruffled shower curtain. Love the fact that it combines both ruffles AND stripes. Mm, mm good! Finally, Chrissie's Collections shared her fun dresser rehab. I love this redo for a number of reasons...pretty color, pretty knobs, pretty fabric in the drawers and the fact that she named the dresser Mr. Peabody. Anybody that names their furniture is alright in my book! Such amazing features!!! WOW! Thanks for hosting, Wendy! 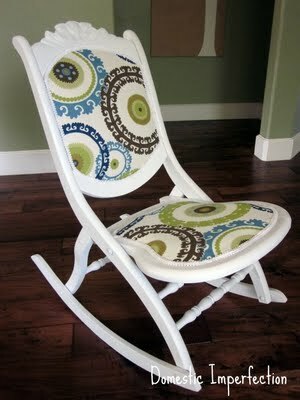 So awesome to have my rocker featured! Thanks! Thanks for hosting and thank you for the feature! I am really honored! sorry about accidentally posting twice. blogger is so weird sometimes! Thanks for hosting! Oh no. Now the idea of naming my furniture has been released into my brain. What have you done?! Thank you for hosting and kicking off my weekend! Thank you so much for hosting! Love your Link Party! So many creative ideas out there. Thanks for letting me party at your place today. Lots of great ideas. Thank you for hosting! Where have I been that this is my first time here?? I'm your newest follower and party goer! Hi! Love your blog! I am a new follower! Thanks for hosting... I linked up! Happy Friday! Stop by sometime and say hi! 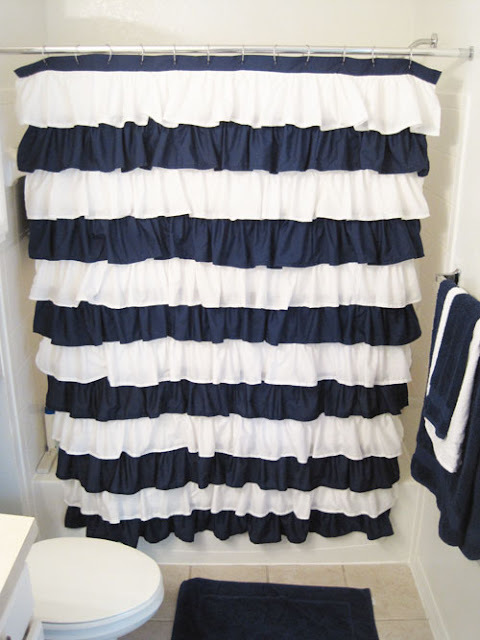 Thank you for the sweet comment about my Ruffle Shower Curtain. I appreciate you featuring it! I love your site...I've enjoyed checking it out. I featured it in my blog hop today. Love Denise's kitchen! That ruffled shower curtain is so cute- love it! Thanks so much for featuring Mr. Peabody. I have bee MIA from blogging while getting my kiddos ready to start back to school. What a nice surprise to come back to! Thanks for hosting, Wendy! I am SUUUPER late to the party this week, but I linked up two projects to make up for my tardiness (that's how it works, right? : )). Egg Carton Sparkle Flowers (#440), and my Reversible Love Letters Bunting Banner (#442 I had to link twice because the pic didn't go through the first time, and I couldn't see where to delete it. Wow, I'm batting 1,000! ).